SACRAMENTO  California governor Arnold Schwarzenegger, apparently tortured by first lady Maria Shriver's habit of alternating between authentic Eric Gagne and Frankie Rodriguez jerseys as nightshirts, threatened today to contract the Los Angeles Dodgers and the Los Angeles Angels of Anaheim into one team. "It's too confusing," he said. "Los Angeles ... Los Angeles ... who can keep track?!" Outside the Lines examines why despite the standings or players, the Cubs, Dodgers and Yankees are the King of the Hill in their respective cities. Sunday, May 22, 9:30 a.m. ET. Bob Ley hosts. Some political analysts accused the governor of grandstanding on a nonissue, but Schwarzenegger insisted the conflict was something he felt passionate about. Citing a personal need for boudoir-fantasy clarity and a statewide need to eradicate cultural and political ambiguity, the governor said he will soon meet with owners Frank McCourt and Arte Moreno to discuss the merger. "I hope we can reach a resolution satisfactory to both sides," he said. "But I am not afraid to exercise executive privilege in this matter, even if that means putting both girly-men in a headlock and seeing which of them pees his pants first." LOS ANGELES  In a joint news conference, delayed two hours and thirty-seven minutes while their advance teams argued over who would speak first, Los Angeles Dodgers owner Frank McCourt and Los Angeles Angels of Anaheim owner Arte Moreno announced today that the winner of this weekend's three-game freeway series between the two teams will exclusively and forever after own the rights to the name "Los Angeles." "The governor agreed," said McCourt. "That this was a reasonable," said Moreno. "And equitable," said McCourt. "Resolution of," said Moreno. "Our diff-," said McCourt. "-erences," said Moreno. 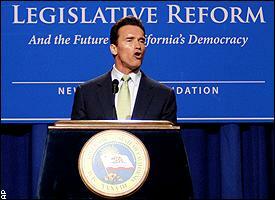 Arnold's latest idea for reform: Just one team named "Los Angeles." Details of the agreement, issued in a published statement after the news conference, include a seven-run rule by which the first team to achieve a seven-run-or-greater advantage in any of the three games gains permanent ownership of Vin Scully's golden voice, an error clause that saddles the team that commits the most errors over the three games with the played-out mojo of the Rally Monkey, and a rainout provision that states that in the case of a deciding game being called because of bad weather, McCourt and Moreno will pitch baseball cards against the outfield wall for the rights to the name. LOS ANGELES  Less than one hour before game time, Angels manager Mike Scioscia announced he was recusing himself from participating in the "Los Angeles" series because he had a profound conflict of interest. "While the jovial, grizzled, players' manager in me bleeds Angels red," Scioscia said, "the gritty, clean-cut, plate-blocking me is all about Dodger blue. I'm like Sybil right now. I'm no good to anyone."